"Delicious! Serve with a crispy salad and garlic bread, and you'll have a dish your family will love! The kids like to help stuff the noodles too!" Cook manicotti in boiling water until done. Drain, and rinse with cold water. In a large bowl, combine ricotta, mozzarella, and 1/2 cup Parmesan, eggs, parsley, and salt and pepper. Mix well. Pour 1/2 cup sauce into an 11x17 inch baking dish. 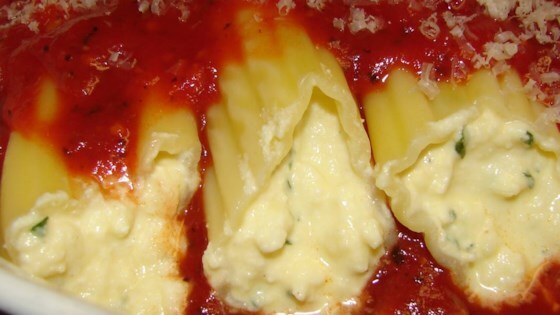 Fill each manicotti shell with 3 tablespoons cheese mixture, and arrange over sauce . Pour remaining sauce over top, and sprinkle with remaining Parmesan cheese. Bake 45 minutes, or until bubbly. Manicotti are stuffed with three-cheese filling, sauced, and baked to beautiful. This is a great dish. I used a big ziplock and cut a hole in the corner to squirt the filling into the manicotti. Tasty. I put the cheese filling nto a ziploc, cut the corner, piped it into manicotti. No mess. Would make it again.